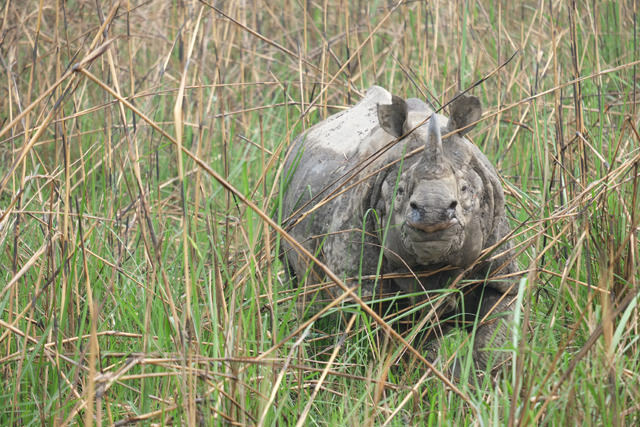 Rhino grazing near the buffer zone in Chitwan recently . 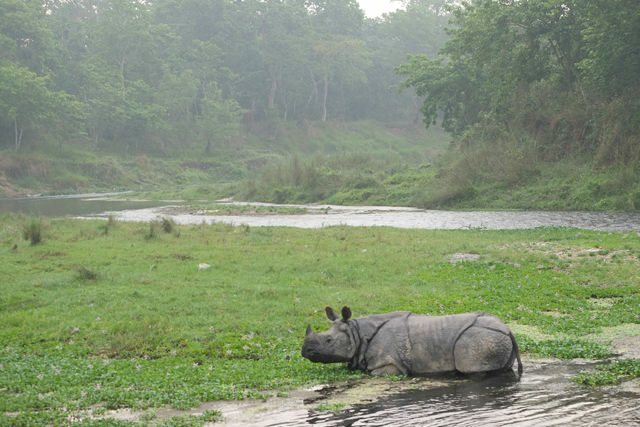 Even before reaching Chitwan National Park, visitors to Nepal notice abundant imagery of the sanctuary’s most celebrated animal: the Greater One-horned Rhinoceros. It appears on posters at Kathmandu airport, a pair guards the steps of a temple that collapsed in the 2015 earthquake, and in Sauraha it is on hotel murals and wood carvings for sale to tourists. 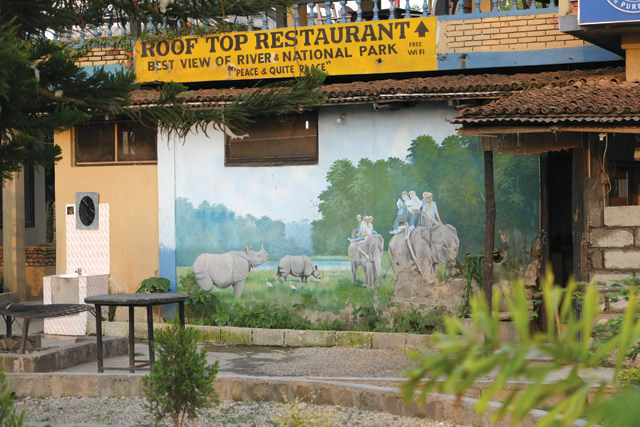 Live rhinos are the park’s most important attraction but rhinos often venture outside its boundaries, and a video of one roaming the streets of Sauraha at night has gone viral on YouTube. The rhino has a place in Nepali culture: it is featured on a bank note and gaida is now shorthand for Rs100. 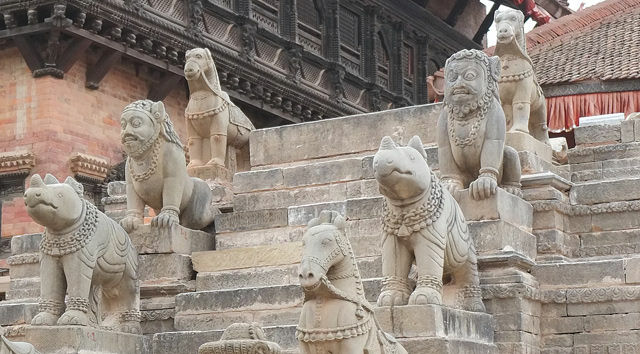 SAVE THE RHINO: A pair of rhinos guards the Siddhi Lakshmi Temple in Bhaktapur that was destroyed in the 2015 earthquake. In his book, The Soul of the Rhino, Hemanta Mishra says the main impetus for setting up Chitwan National Park was to conserve rhinos. Nepal’s secular political parties wanted to elevate the rhino as the national animal during Constitution drafting, but it lost out to the cow. The combination of army patrols inside Chitwan and economic growth and enfranchisement of communities in the buffer zones has been credited with the near-zero poaching, and an increase of the rhino population from less than 400 at the end of the conflict in 2006 to 645 today. But nine people in the park’s vicinity have died in rhino attacks in the past few years and the animal is not popular with farmers, whose crops are regularly raided. While the lack of retaliatory killings highlights the high priority Nepalis accord to safeguarding rhinos, such tolerance cannot be taken for granted. Honeybee fences used by Chepang villagers in the Beldada Community Forest in Chitwan to deter raids by wildlife. Early warning through smart cameras could alert villagers of impending wild animal attacks, as has been done by conservationists in Kenya and India. Cameras there recognise and photograph incoming elephants, and then alert villagers through text messages. Another mechanism to prevent human-animal conflict, already employed by Chepang villagers outside Chitwan, is bee fences. 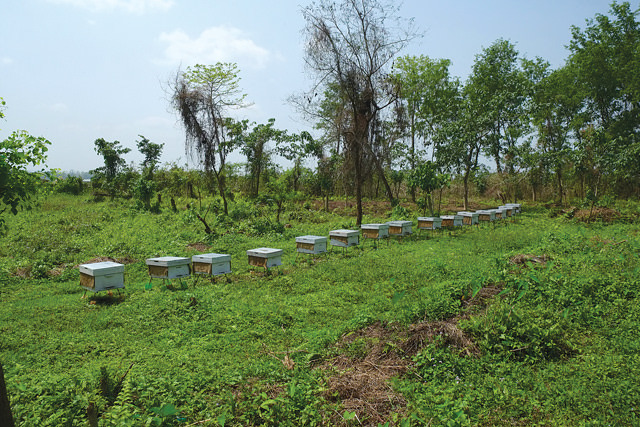 First innovated in Kenya in 2012 to reduce crop-raiding by African elephants, these devices use honeybees to various ends: deter animals, produce honey for farmers and to pollinate crops. Chepang villagers who have prospered after switching from rhino poaching to conservation. Conservationists have recently seen the need to enlist Chepang villagers in the fight against poaching through youth-based patrols modeled on those long employed in the Tharu buffer zones. The buffer zone model has benefited villagers outside the park and allowed for a revival of the aboriginal Tharu culture through homestay tourism. Yet the under representation of Tharus in the National Trust for Nature Conservation and as buffer zone chairpersons means there remain shortcomings in participatory conservation. 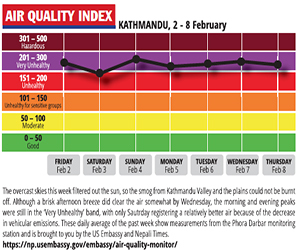 In addition, the recent reduction of the thatch-grass gathering period from three months to just three days a year has placed severe constraints on the traditional Tharu lifestyle. To maintain the Tharu’s commitment to rhino conservation, it may be necessary to ensure their greater representation in the NTNC and buffer zone committees, along with a relaxation of the laws limiting buffer zone cultivation. Wall painting of a rhino in a Sauraha hotel. For all of the diverse ethnicities inhabiting the Tarai, a more streamlined program of compensation for wildlife-caused losses is overdue. The government recently doubled the amount paid for medical treatment for injuries to Rs20,000 and Rs100,000 to relatives of villagers killed by marauding animals. However, there are long delays in disbursement and no compensation to buffer zone farmers for crop damage. A recent study of villages near Bardia National Park and Kosi Tappu Nature Reserve found almost universal support for a trust fund financed by monthly contributions from members, which would compensate for destruction caused by elephants. In combination with the use of wildlife-deterring technologies, the strategy would allow buffer zone residents greater say in conservation policy and also streamline compensation. It is also up to the NTNC to inform Sauraha residents about the importance of Nepal’s most successful and long-rooted conservation policies. Translocation of rhinos from Chitwan to Bardia and Sukla Phanta National Parks has created insurance populations and allowed for the spreading of eco-tourism revenue in the Tarai. The NTNC needs to more closely engage the public on translocation, highlighting the risk of confining the country’s rhino population to one locale and the promise of reducing local crop destruction and human fatalities. 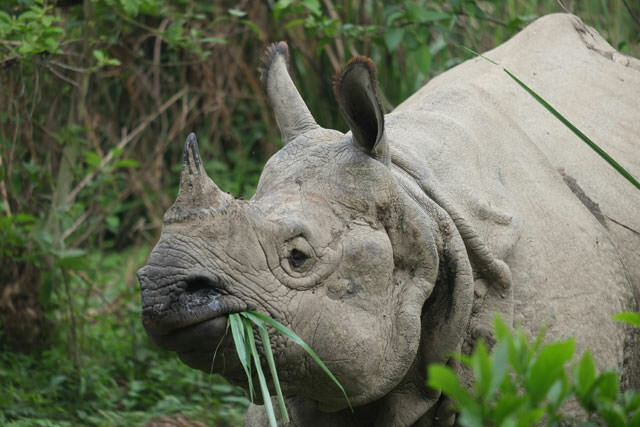 Nepal offers a beacon of hope in the bleak landscape of international rhinoceros conservation. Yet with effective policing inside the parks and the elimination of domestic wildlife smuggling networks, the country could be a victim of its own conservation success story. More rhinos means greater chances of human encounters, and tension with Chitwan’s farmers could mount. Nepal doesn’t need a radical departure from its current strategy, it just needs to strengthen community-based conservation mechanisms already in place while improving the efficiency of compensation for wildlife damage. Alex Dudley has studied human-wildlife conflict in Tanzania’s Arusha National Park. A healthy debate between the two can only help a balanced view prevail over extremist postures. Spartan conditions have led to a higher overall standard of Japanese cuisine in the Valley.